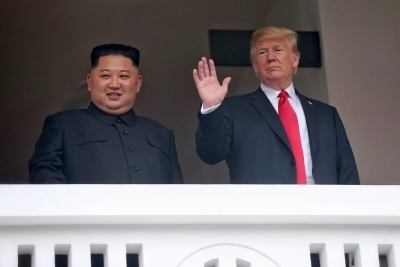 Washington July 13 (IANS) US President Donald Trump released a letter on Thursday on his Twitter account which he said he received from North Korean leader Kim Jong-un and touted the "great progress" in bilateral talks between the two countries a month after the two men met in Singapore. "A very nice note from Chairman Kim of North Korea. Great progress being made " Trump said in a tweet that included a copy of the letter in Korean and an English translation. In the English version dated July 6 Kim writes that the June 12 summit in Singapore "was indeed the start of a meaningful journey". "I firmly believe that the strong will sincere efforts and unique approach of myself and Your Excellency Mr. President aimed at opening up a new future between the DPRK (Democratic People s Republic of Korea - the country s official name) and the US will surely come to fruition " Kim wrote. "Wishing that the invariable trust and confidence in Your Excellency Mr. President will be further strengthened in the future process of taking practical actions I extend my conviction that the epochal progress in promoting the DPRK-US relations will bring our next meeting forward " the North Korean leader concluded. The letter s date corresponds to the day before the North Korean Foreign Ministry said that US Secretary of State Mike Pompeo s position during just-completed talks in Pyongyang was "regrettable" Efe reported. State Department spokeswoman Heather Nauert said on last Saturday that Pompeo had handed Kim a letter written by Trump meaning that Kim s letter may have been a response to the US President a few hours before the North Korean government denounced Washington for its "unilateral and gangster-like demand for denuclearization". Despite criticisms from Pyongyang Washington has maintained a positive outlook regarding bilateral talks and Pompeo said Thursday in Brussels that he was confident that the North Korean government was committed to denuclearization.